Thanks, I needed that quote. It will help me explain a nebulous Web project to my staff. Jim, how nice to see your name in the comments for the first time. And how imaginative of you to believe that an errant quote you pick up from a blog might actually be deployed to useful effect in the real world. That gives me a nice little psychic energy boost today. I've always secretly been a little biased toward your company because it's headed by a guy, that would be you, who has a journalism degree. I'm guessing that means your folks pay attention to words more than most web shops. Anyway, thanks for visiting, Jim, and especially for leaving this nice comment. Have a great holiday if I don't see you before then, and here's hoping our Cavs can pick up the pace and help energize your photography. When LeBron, Larry and Sideshow Andy get back on the court, all will be well. There is as much inspiration to be found in the artist's words as in their work. 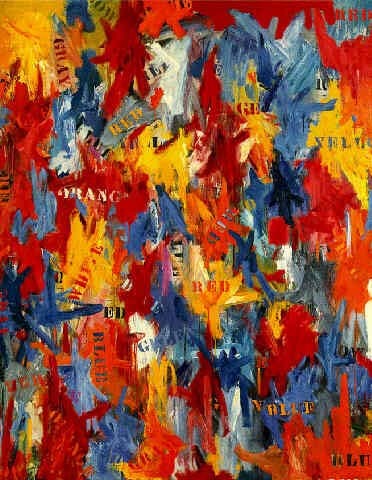 I didn't know Jasper Johns before, so thanks for your post. A good writer is just as hard to find as a good programmer but I can't convince them of that! Yes on the Cavs returnees, at least until brittle Larry gets injured again, as I expect will happen before too long. But it will be wonderful to see Lebron and Andy back together again. I can't pretend to have known much of anything about Jasper Johns before, either, but was blown away by that quote, and then equally blown away by that painting when I found it on a Google search. And when great programming is married to great design and great words, the result is sublime. Good luck in your continuing efforts to orchestrate it all, Jim.